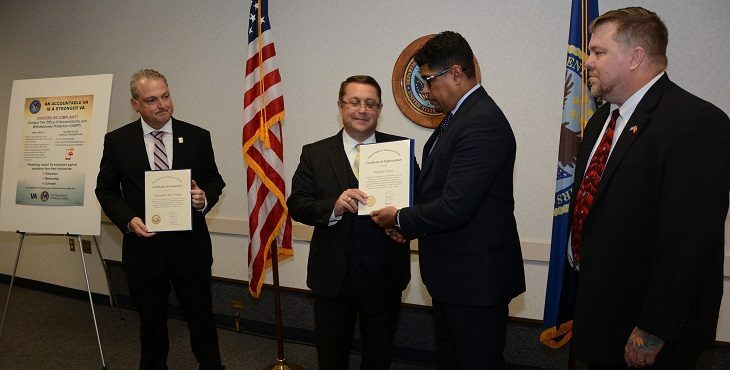 VA’s Office of Accountability and Whistleblower Protection recognized the outstanding efforts of two Overton Brooks Veterans Affairs Medical Center employees in Shreveport, Louisiana Monday. Medical Center Director Richard Crockett and Army Veteran and licensed clinical social worker Christopher “Shea” Wilkes worked along-side each other for the past seven months in OAWP’s first mentor program. Together they developed the anonymous hotline “Advice for the Director” which is built into their existing VA website where employees and Veterans can express concerns within the local facility. Wilkes formed a committee including employees from several departments in which they hold regular meetings and with Crockett’s unwavering commitment to the program, they can immediately address issues raised internally. Ultimately, because of the mentor program under the Accountability and Whistleblower Protection Act of 2017, Veterans are experiencing decreased wait times and witnessing an overall boost in employee morale at the facility. Back in 2015 under different facility leadership, Wilkes blew the whistle on what he called a “systematic effort to game the patient wait lists and disguise the breakdown of Veterans health care delivery.” For these and several other disclosures, Wilkes testified before the United States Senate Homeland Security and Governmental Affairs Committee regarding “ongoing whistleblower retaliation within VA.
Wilkes said he began to see relief in 2017 with the newly established VA Office of Accountability and Whistleblower Protection and a newly developed mentor program geared towards helping build trust and solid communication between senior leaders and employees. Crockett volunteered to participate in the office’s first mentor program and worked closely with Wilkes to address the concerns raised. OAWP’s Deputy Executive Director Todd Hunter visited Shreveport Monday and presented Wilkes with a certificate of graduation and Crockett with a certificate of appreciation on behalf of the office. The success of the Office’s mentor program in Shreveport will now serve as a model nationwide to help VA employees who express concerns rebuild trust with their local leadership teams and continue to improve on services for our nation’s Veterans. Ashleigh Barry is a strategic communications advisor in the Office of Accountability and Whistleblower Protection. She has an extensive background in investigative journalism where her coverage garnered multiple Emmy Awards and the distinctive Edward R. Murrow Award. Her most recent assignment was in Dallas, Texas, at NBC Universal, she also anchored and reported at CBS and ABC News affiliates in Phoenix, Arizona , Columbus, Ohio, Milwaukee, Wisconsin and Lubbock, Texas. any investigation where the employees got to speak about the mismanagement and abuse. I would love to be involved with the mentor program. Can someone assist me with this.